We love working & returning to the Sheraton Grand Marina Mirage, whether that is us completing styled shoots or engagements, we were extra excited to return once again for Michael & Alena's BIG day, Sheraton Grand Mirage offers a superb backdrop for wedding photos and a stunning location to celebrate in style. 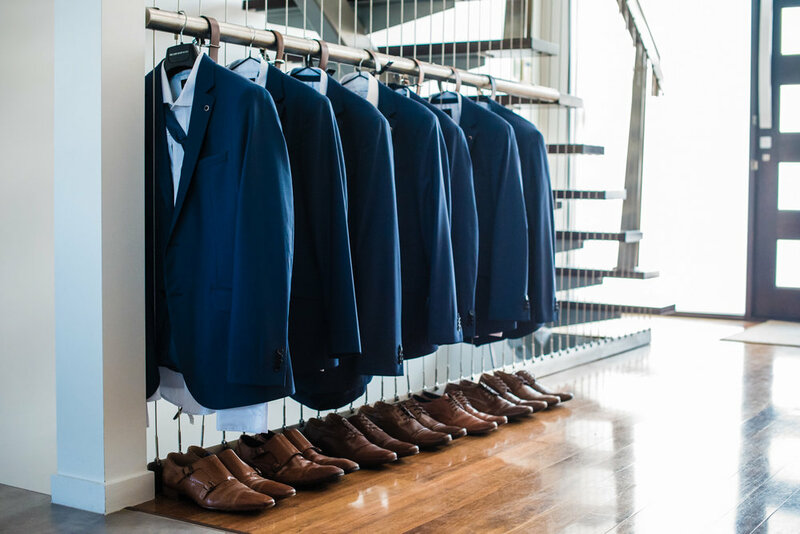 Our full bridal party was all getting ready at the same location which makes life easy for us but also saves a lot of time, as it means we can take images and video of the groom and then just pop upstairs to do the same for the bride. Alena looked stunning, having her make up done by the talented Jasmine Hand - @makeupbyjaz IG. Hair styled beautifully by Kirsty Gibson- @MissBlissHair IG. 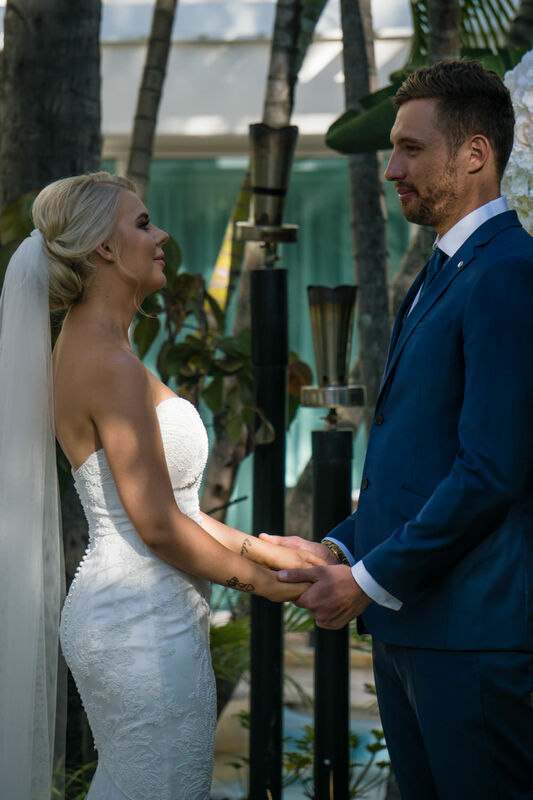 Michael and Alena's matrimony was going to be an intimate wedding ceremony on a lush green island, nestled amongst tropical gardens and sparkling blue lagoons, with seats for up to 50 guests. The guys arrived in style in an awesome Lamborghini supplied by Rent a Dream Car, they were already turning out to be a fun bunch to work with as they were more than keen with getting all their fun shots; this made for some excellent video footage of the crew just mucking around. It wasn't long though before we headed off back down to the ceremony and await the bride to be. The Bride & her brides maids also arrived some serious style, making the exciting journey to the venue in white Limo supplied by Golden Gate Limos. Quickly setting up the tripods, it was crunch time. As the bride had arrived & the music was starting to play with the guests now taking their seats. 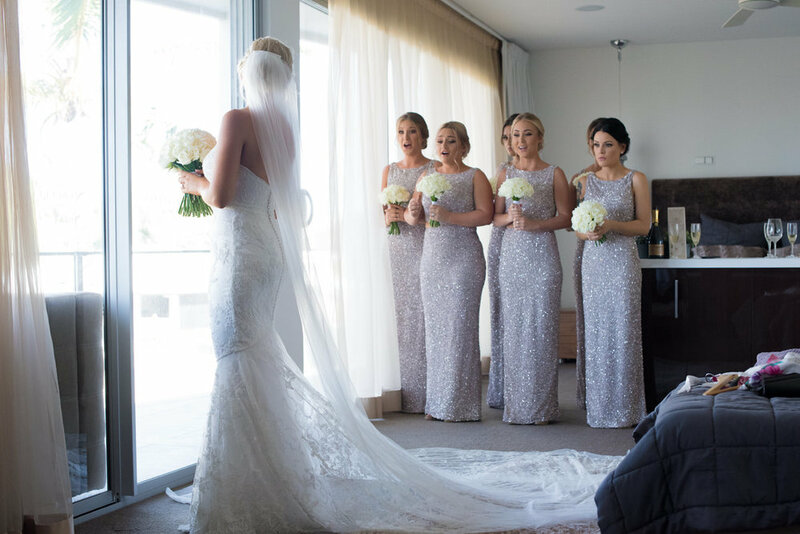 Alena's six bridesmaids adjourned matching glittery grey long gowns, with their hair wrapped perfectly they were no match though for the bride herself as she was wearing a gown made by her aunty Eileen Kirby that perfectly hugged her wonderful figure. You could tell tears were in her eye's as she descended down the aisle to her groom, he was beyond ecstatic to have her finally by his side. After the ceremony was conducted, we were off to the photo's section, what made this even better and more breathtaking was the fact that we were able to use the entire suite of grounds within the Sheraton. This venue provided avid opportunities to shoot stunning picture of the bride, groom & other guests. As the sun was still high in the sky, we decided to roam first around the areas within the Sheraton, this made for some fantastic group shots. We eventually ventured to the beach, where Michael & Alena got a little extra creative with us by doing a CRAZY AMAZING dip!! As a result, we managed to get some excellent photography & videography. 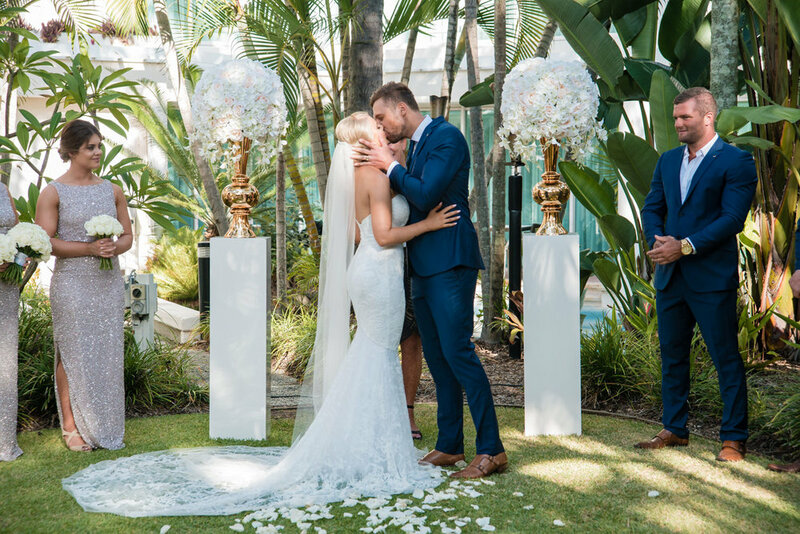 As we turned up at the wedding Venue function room called the Horizons we were loving how gorgeous it looked, the styling of the event was just perfect, Beautiful Weddings Australia truly did an amazing job! . 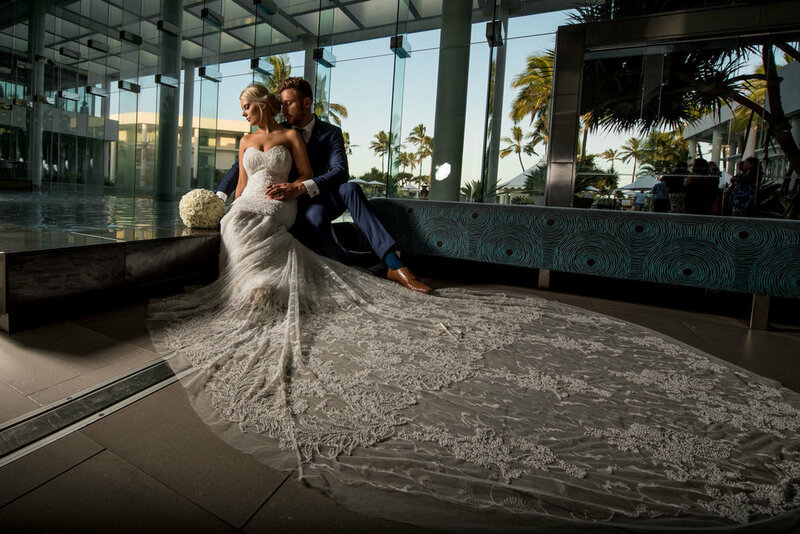 Horizons is one of the Gold Coast’s most iconic wedding venue with floor to ceiling glass windows overlooking sparkling resort lagoons and the magnificent ocean, the Horizons room captures the true beauty of Sheraton Grand Mirage, which was perfect for this couple coming all the way from Sydney. Everyone had a great time through out the reception, the photo booth was a success that everyone took advantage of. We listening in on some great speeches by both of Michael & Alena's friends and family from around Australia. Next stop was cutting the cake, created & beautifully decorated by Yeners Cakes. As the first dance started it was so beautiful to see this couple wrapped up in each others love. We were catered to an extra special performance as the couple pulled out all the stops in order for us to get the best footage! The show didn't stop here, the bridal party was next to take their place on the dance floor, pulling out all the stops to show of there groovy moves. The drinks flowed, the music blared and the reception charge full steam ahead into what was surely a fantastic night, to be remembered by all!